COTW: Did Police Shoot Suspect for ‘Crime” of Sleeping in Car? What’s notable about the post, in a totally expected manner, is how hard the “journalists” writing about this event are working to make it appear to be yet another racially motivated killing by racist police in institutionally racist America. We can literally see the false racial narrative being created in front of our eyes. The races of the officers involved are not mentioned, but given that the police are part of the amorphous “institution” the narrative presumes that the officers are agents of institutional racism regardless of their individual races (as when black police officers were prosecuted for the purportedly racially-motivated killing of Freddie Gray in Baltimore—all six officers in that case were, of course, cleared of all charges). The management of a fast-food restaurant called the police to report a driver passed out in a car in the drive-through lane of the restaurant, about 10:30 PM. The police observed a handgun (later learned to be stolen) in the driver’s lap. While officers were still positioning a patrol unit to the rear of the vehicle, and waiting for the supervisor, the driver began to suddenly move and looked at the uniformed patrol officers. Officers gave the driver several commands to put his hands up. The driver did not comply and instead he quickly moved his hands downward for the firearm. Fearing for their safety, six officers fired their duty weapons at the driver. The driver died of his wounds. What False Narrative is Being Created? Pretty straightforward, right? Well, it ought to be. But that wouldn’t fit the narrative. Is this story headlined “Six California police officers fatally shoot suspect reaching for gun”? Of course not. The headline in The Hill is instead: “Six California police officers fatally shoot rapper found sleeping in car. Wait, did the police shoot this suspect for the “crime” of sleeping in his car? Was the suspect asleep when the cops shot him? Of course not. But that’s clearly the narrative being constructed in real-time, right before our eyes, and it’s likely to be just another of the false narratives that we’ll have to live with for years to come. This is much like the false narrative that Trayvon Martin was killed for the crime of wearing a hoodie and having Skittles and ice tea, rather than killed in lawful self-defense when he tried to maim or murder neighborhood watch volunteer George Zimmerman. Or the false narrative that Freddie Gray died because of a neck injury allegedly caused by some never-specified physical abuse by the officers who arrested him, rather than from his own stupidity in standing up in a moving van while handcuffed and shackled and falling on his head as a result (all the officers involved were ultimately cleared of all charges). Also notable is that fully half the news report is devoted to quoting the dead suspect’s family, even though none of them has any personal knowledge whatever of the events that led to the suspect’s death, and thus cannot possibly have anything substantive to contribute to understanding whether the officers’ use of force was justified. Naturally, the article tells us that “McCoy’s [the suspect’s] family has since public questioned the police response.” There is, of course, nothing wrong with questioning any police use of force—police need to be held accountable for their use-of-force decision-making just like anybody else. Naturally “held accountable” does not necessarily mean “found guilty of misconduct,” it simply means “evaluated for lawfulness.” This should always occur whenever one person kills another. Such “questioning” is also only useful if it is based on actual facts, actual evidence, and actual law, and isn’t merely an emotive exercise (of course, an emotive response is a normal response for the suspect’s family members, which is why they aren’t the ones who evaluate the lawfulness of their family member’s killing). Too often, too, such “questioning” appears to be not a search for the truth of what happened but rather part of a concerted propaganda-based effort to extort §1983 money from the taxpayers (I don’t see the name of Attorney Benjamin Crump, or another attorney like him, associated with this event yet, but I expect to see it pretty darned soon). Actually, there was: that’s precisely what “Don’t reach for the gun!” is. It’s an explicit attempt to try to work out a peaceful solution. That goes out the window, however, once the suspect actually reaches for the gun. 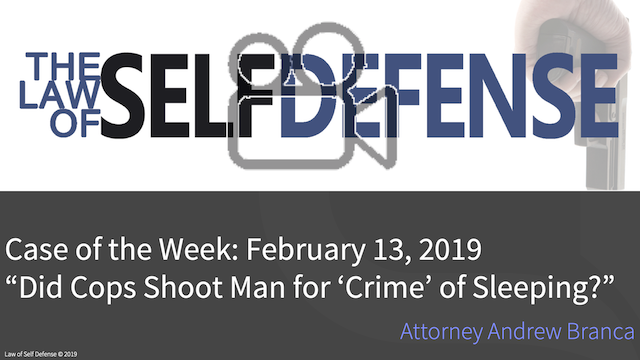 The false suggestion, again, is that the police shot the suspect for the “crime” of sleeping, rather the actuality that they shot the suspect for presenting an imminent threat of deadly harm. The Hill reports: “McCoy’s family has since called on the officers involved in McCoy’s death to face criminal prosecution.” Coincidentally (not), a criminal prosecution would contribute substantially to the strength of a §1983 civil suit against the officer’s department, with the prospect of a huge taxpayer-funded payday for both the suspect’s survivors and their lawyers. Bottom line: How do you know the media is lying, participating in a false narrative creation, or at least substantially deceiving, about a self-defense event? Easy: they’re covering the story. Pro-tip, folks: If you don’t want to get shot by police, don’t conduct yourself in such a manner as to be reasonably perceived as presenting police with an imminent deadly force threat.